The Boeing 717 is a jet airliner. It has two engines, which means that it is a twinjet. It also only has two columns of seats, which makes it a narrow-body plane. The Boeing 717 was designed and sold by McDonnell Douglas. 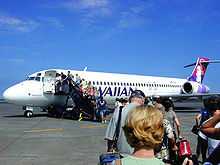 It was called the MD-95, which was designed from the DC-9. The 717 can hold up to 117 passengers. It can fly for 2,060 nautical miles (3,820 kilometres). The 717 has two Rolls-Royce BR715 turbofan engines. McDonnell Douglas was going to make all MD-95s in China. However, in 1994, McDonnell Douglas began to look for a cheap place to make the planes. Halla Group in South Korea was made the wings of the plane, Alenia of Italy made the fuselage, Aerospace Industrial Development Corp. of Taiwan make the tail; and a part of Korea Air Lines made the nose and cockpit. ↑ 1.0 1.1 "The Boeing 717". Boeing Commercial Airplanes. Retrieved January 4, 2011. ↑ 3.0 3.1 3.2 Boeing (May 23, 2006). "Boeing Delivers Final 717s; Concludes Commercial Production in California". Press release. http://www.boeing.com/news/releases/2006/q2/060523a_nr.html. Retrieved December 9, 2010. ↑ 5.0 5.1 5.2 Norris, Guy; Wagner, Mark (1999). Douglas Jetliners. MBI Publishing. ISBN 0-7603-0676-1. ↑ Becher 2002, p. 107. ↑ "The Boeing Company ... The Giants Merge", Boeing history. ↑ "Aerospace Notebook: Orphan 717 isn't out of sequence", seattlepi.com, December 22, 2004. ↑ "Air Canada buying 90 jets from Bombardier, Embraer". CBC News. CBC. December 19, 2003. Retrieved December 30, 2009. ↑ Boeing (January 15, 2005). "Boeing to Recognize Charges for USAF 767 Tanker Costs and Conclusion of 717 Production". Press release. http://www.boeing.com/news/releases/2005/q1/nr_050114a.html. Retrieved December 30, 2009. ↑ Flying the 717-200, Airline Pilot, Retrieved 15 December 2007. 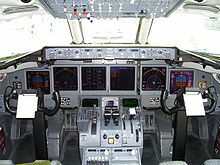 ↑ Boeing 717 incidents, Aviation-Safety.net, March 22, 2009 . This page was last changed on 12 January 2019, at 22:50.